I met my first House Gecko on a trip to visit my sister-in-law, Barb, in New Orleans. My husband and I slept in the family room at the back of the house and noticed a tan lizard on the ceiling—what? This was a wild house gecko who came and went as he pleased, and spent most of his time high up on the walls while visiting Barb. My next meeting with a House Gecko was in Hawaii at the townhouse of a friend. The morning after we arrived, a bright green gecko darted from the open potato chips bag we had left on the counter the night before. He disappeared behind the microwave and we never saw him inside again, although many bright green geckos sunned themselves on the lanai. 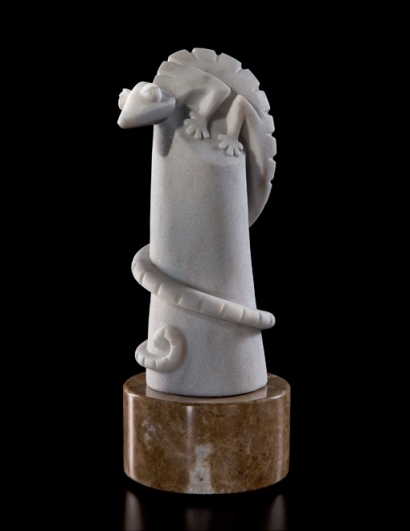 The House Gecko stone sculpture is carved from my last substantial piece of Vermont marble given to me by a friend. Other pieces made from this stone are “Nice View From My Tail” and “Backyard Debutante.” As I mentioned in previous posts of those pieces, the crystal in this stone is huge and sparkles like snow—eye-popping, really! I have been thinking a lot about design. My requirement before beginning a sculpture is that I must first fall in love with the design. I use spirals, triangles, and repeating patterns as formal themes. They are part of almost every sculpture design I have ever created. All three elements are present in The House Gecko. Triangles are inherently interesting to me because of the variety of angles possible within this simple shape. Spirals are a life philosophy—the ascending spiral of existence. Repeating patterns are powerful graphic elements. They are a challenge to create successfully, but there is also a satisfying contemplative aspect to their creation. I love the work of Russian designer Erte (accent on the second e). Spirals and patterns are a way of life for him. His work goes beyond decorative to a sublime realm where all the forms work together to create fun, powerful images. When viewed from a distance, his shapes and colors capture the eye. When viewed up close, the detail is mesmerizing. A lot of my rules of thumb for design came from my experience as a Disney Animator. Contrasting vast spaces with areas of detail speeds up and slows down the eye as it moves over the forms. This creates movement within the sculpture that strengthens the movement of the pose itself. Contrasting straights against bends is the squash and stretch of animation and also creates movement. Twins and tangents are always avoided because they destroy movement. Symmetry is death (twins), and more than 2 lines meeting in the same point tends to flatten even an already dimensional form (tangents). Design is part of planning, and I love to plan. The anticipation of a sculpture is part of the fun of making it for me. I love knowing where I want to go with a sculpture and the challenge of trying to get there. The exhilaration on successful completion is an artistic high–with one-of-a-kind sculpture one never knows if a particular idea is going to work until it is finished. Carving stone in my studio is a solitary process. I am able to do just about everything myself to create a stone sculpture. One of the few things I require help with is drilling pin holes. Tall, thin sculptures like The House Gecko require pinning to hold them securely to the base. Pin holes must be drilled carefully so the pin is perpendicular to the base on both the y and z axis. This requires 2 sets of eyes. My friends Tammy and Barb have both helped me to drill holes in my sculptures, and I am most grateful for their help—fun friends with sharp eyes and fierce concentration! Thank you, ladies! My next piece is another white marble, this one new to me—Sivec (sa-VETCH) from Greece. This stone is pure white—no vein, no bedding plane—essentially a clear white canvas from which to compose my next creature. I am curious to see the play of light over the forms. Will the medium read as stone since it has no vein? Will the colors of light be more vivid because it is a pure white reflecting surface? I’ll be sure to let you know.